We were so close to Samsung's Unpacked event at CTIA next Tuesday, but both Google and Samsung have for some reason decided to postpone the event to an unspecified later date. It's unclear why both companies would decide to do such thing with all the immense hype currently surrounding the Nexus Prime and Android 4.0 Ice Cream Sandwich. We are unsure as to whether this statement is real or not, as there's no official source from Samsung or Google, but we really hope it turns out to be a bad joke. There's been speculation floating around the web already as to why the event might have been put off. To some it's in mourning of Apple co-founder and former CEO Steve Jobs. 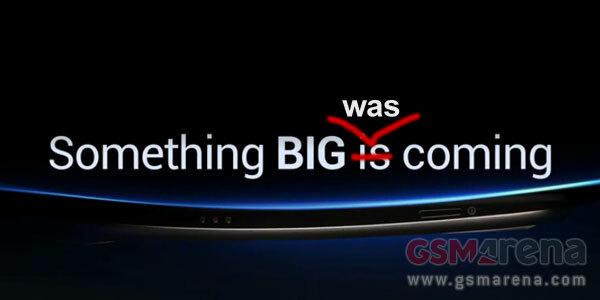 Or it could be even be ditching the hardware Samsung has built (hence the 5MP camera rumor?) and going for a more advanced setup. We've seen it happen as a response to an Apple announcement before. When Apple announced the iPad 2, Samsung had just announced their original Galaxy Tab 10.1 at the MWC 2011 but they were quick to rename it as the Galaxy Tab 10.1v and later on discontinue it. Several months later they came up with the slimmer and cheaper Galaxy Tab 10.1 that we now know. We'll keep looking for more information on the matter. What are your thoughts? Why do you think Samsung and Google postponed their Nexus Prime and ICS launch? it's pretty simple really ... Ice Cream Sandwich was not ready for launch ... remember the infamous Windows 98 Plug and Play demo into a BSOD!